I made these the other night, and they turned out so good I have to share. Even though I didn’t take pictures, like an idiot. So you’re just going to have to imagine how scrumptious they look, and when I make them again I’ll update this with pics. Deal? 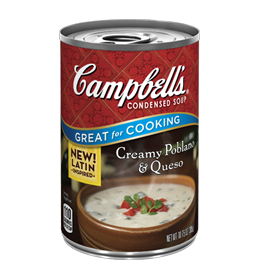 Have you seen Campbell’s new latin inspired condensed soups? I’ve used them all, and I’m pretty impressed with them. They’re great for cooking and messing around with different recipes. My favorite, and the one I used here, is the Creamy Poblano and Queso soup. It has a lot of flavor without being overly spicy, and the cheese taste is nice and smooth and not fake-tasting. I decided to make stuffed peppers this weekend, but my friend gets bad heartburn when she eats red sauces. So I came up with this! Make sure to get nice big peppers that have as flat of a bottom as you can find – they’re easier to stuff and bake that way. Try it sometime soon – it was warm and flavorful and filling, great for a winter night. Prepare the rice first, especially if using brown rice. This is the absolute best method for perfect brown rice: Fill a medium sized pot with water; add salt. Bring water to a boil, then add rice. Boil uncovered for 40 minutes, stirring occasionally. Turn off heat and drain the rice for 10 seconds. Add rice immediately back to the pot and cover, letting it sit off the heat and steam for 10 minutes. Prepare the peppers. Cut the tops off the peppers, starting about half an inch down from the stem. Cut away the good parts of the tops from the stems and chop; discard the stems. Remove the ribs and seeds from the peppers. You can parboil the peppers to make them softer if you’d like – place them in a stockpot of boiling salted water for 1-2 minutes – but I skipped this step and they were fine. Add olive oil to a large skillet, about two turns of the pan, and turn on heat to medium. When the oil is shimmering and coats the bottom of the pan, add the chopped onion, chopped peppers, and salt. Sauté until tender, about five minutes, then add the minced garlic. Sauté for one minute more, then add the ground turkey or beef. Let the meat sear for about 3-5 minutes, until nice and brown on the bottom, then flip the meat over and break it up with a spatula. Cook until no pink is left in the meat. If you need to pat off any grease at this point, feel free – I found I didn’t need to do that at all with ground turkey. Add the soup and 1 can of milk to the pan. Whisk or stir with a fork until it’s well mixed. Add the cumin and black pepper to taste. You could also add salt, but be aware that condensed soups have a fair amount of sodium – I didn’t add any myself. Stir in the Ro*Tel tomatoes and the rice. Simmer about five minutes. Place the peppers into a baking dish. Spoon the filling into the peppers until full, then fill the pan around the peppers with the remaining filling – this will help the peppers stay upright during cooking, plus give people extra filling. Sprinkle shredded cheese over the top of the peppers. Bake for 30 minutes. Let them sit for a few minutes out of the oven, then enjoy them with thick toasted bread or cornbread! 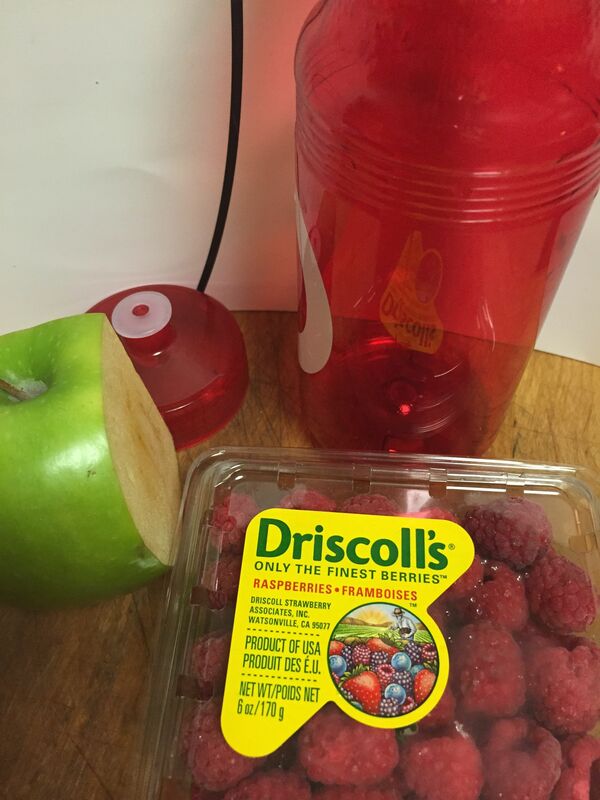 Suggested drink pairing: Obviously these would be great with a nice cold beer of your choice – I’m partial to a local brew called Farm Girl by Lift Bridge – but a red sangria would be tasty too!